The September 16, 2015 earthquake occurred off the north coast of Chile with a magnitude of 8.3. CDIP's Scripps Pier pressure sensor recorded a clear tsunami signal arriving at approximately 11:50 UTC on September 17. Preliminary analysis shows a peak amplitude of close to 10cm. CDIP's Scripps Pier pressure sensor recorded a small tsunami event arriving at approximately 12:04 UTC on April 2. Preliminary analysis shows a trough-to-crest height of about 6 cm with a period of about 26 min. The March 11, 2011 earthquake occurred off the east coast of Honshu, Japan with a magnitude of 8.9. A tsunami was generated which was recorded throughout the Pacific Ocean. 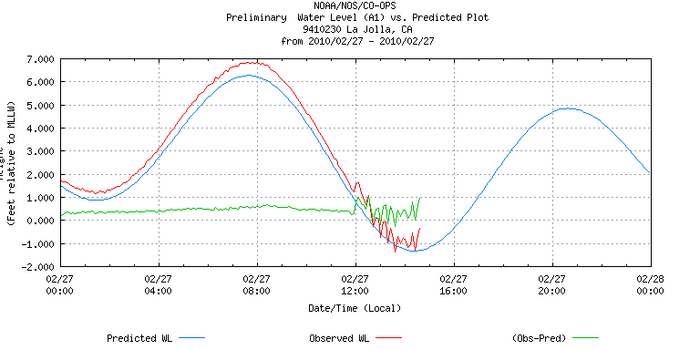 CDIP's Scripps Pier pressure sensor is now showing the tsunami signal; it arrived at Scripps at approximately 08:50 UTC on March 11. Preliminary analysis shows the tsunami arriving with an trough-to-crest height of over 40cm and a period of 36 minutes. In San Diego Harbor the amplitude of the tsunami reached 2 feet. These photos show the change in water level at the Southwestern Yacht Club over a 10 minute period on Friday afternoon. Photos courtesy of Thomas Muschamp. 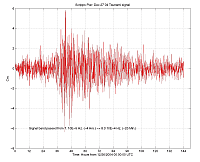 2010 Chile earthquake occurred off the coast of the Maule Region of Chile on February 27, 2010, 06:34 UTC, rating a magnitude of 8.8 on the moment magnitude scale and lasting for about three minutes. A tsunami was generated which was recorded throughout the Pacific Ocean. The CDIP Scripps pier pressure sensor was undergoing maintenance at the time and did not record the event. However, the NOAA tide guage also located on the pier did record it. The plot shows first arrival just about at noon, with the wave train still continuing as of 3pm. Maximum amplitude appears to be about 1 foot and period between 20 and 30 minutes. Amateur video recorded the effects of the tsunami at Ventura Harbor here. At 17:48 UTC on September 29, 2009 an earthquake of magnitude 8.0 occurred south of Samoa, centered at 15.509° S, 172.034° W. A tsunami was generated which was recorded throughout the Pacific Ocean. CDIP's Scripps Pier pressure sensor picked up the tsunami signal; it arrived at Scripps at approximately 05:00 UTC on September 30. The Samoa plot has three graphs, all of which cover 10 hours starting at 02:00 UTC on Sept 30th. The first graph shows 1-minute average readings straight from the sensor (which samples at 1 Hz), and the second shows 2-minute averages. The third and final plot shows 1-minute average readings which have been de-tided. The tide was removed by performing a linear detrend on 60-minute segments of the time series. At 11:14 UTC on November 15, 2006 an earthquake of magnitude 8.3 occurred in the Kuril Islands, centered at 46.577° N, 153.247° E. A mild, low-amplitude tsunami was generated which was recorded throughout the Pacific Ocean. CDIP's Scripps Pier pressure sensor picked up the tsunami signal; it arrived at Scripps at approximately 20:50 UTC on November 15. The Kuril plot has three graphs, all of which cover 8 hours starting at 19:00 UTC on Nov 15th. The first graph shows 1-minute average readings straight from the sensor (which samples at 1 Hz), and the second shows 2-minute averages. The third and final plot shows 2-minute average readings which have been de-tided. 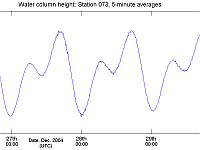 The tide was removed by performing a linear detrend on 60-minute segments of the time series. At 15:27 UTC on May 3, 2006 an earthquake of magnitude 7.8 occurred in the South Pacific, centered at 20.03 S, 174.23 W in the Tonga Islands. A very mild, low-amplitude tsunami was generated which was recorded throughout the Pacific Ocean. CDIP's Scripps Pier pressure sensor picked up the tsunami signal; it arrived at Scripps at approximately 02:40 UTC on May 4. The Tonga plot has three graphs, all of which cover 8 hours starting at 00:00 UTC on May 4th. The first graph shows 1-minute average readings straight from the sensor (which samples at 1 Hz), and the second shows 5-minute averages. The third and final plot shows 1-minute average readings which have been de-tided. The tide was removed by performing a linear detrend on 60-minute segments of the time series. The earthquake occurred at 00:59 UTC on December 26th west of Aceh, Indonesia. It measured 9.0 on the Richter scale, centered at 3.3 S latitude, 95.8 E longitude. (Details of the event's seismology are available from Project IDA.) Although the earthquake and resulting tsunami were generated in the Indian Ocean, the event was of such magnitude that it produced tsunami effects across the globe. These effects were recorded by CDIP sensors in the Pacific at Scripps Pier, California. These plots show the average sensor readings over periods of 2, 5, and 10 minutes; the tsunami signal can be seen atop the tidal movements. These plots show the signal from the tsunami, with tides and other components removed from the sensors' readings. The earthquake occurred at 13:23 UTC on October 4 northeast of Hokkaido, Japan. The earthquake measured 8.5 on the Richter scale and its epicenter was at 42.9 N latitude, 147.2 E longitude. CDIP sensors at Kahalui Harbor, Hawaii recorded the resulting tsunami.